We recently finished another round of our increasingly popular Volunteer Orientation Course. 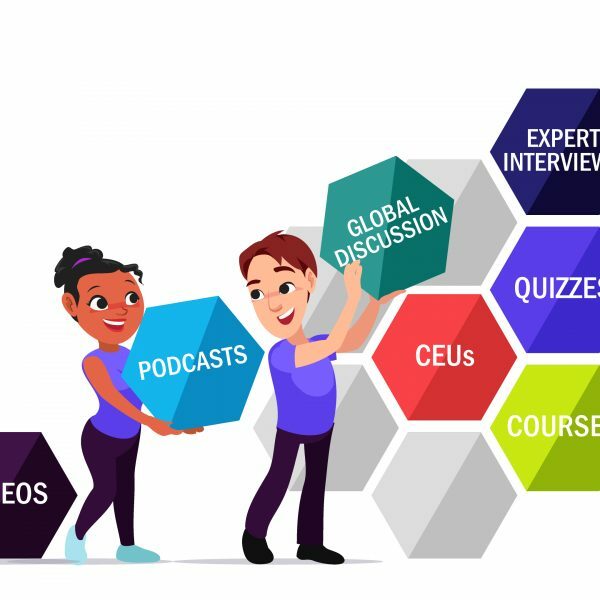 As part of the final assignment members were tasked to write an original piece of work to share with the profession, the contributions were of the highest quality. Below is the great piece of work written by Riccardo Guarise. Pulmonary function tests play a fundamental role in the diagnosis and management of respiratory diseases. This is why research has always tried to direct itself towards their development and refinement. The Lung Clearance Index (LCI) is an indicator of ventilation inhomogeneity derived from the Multiple Breath Washout Test (MBW). LCI appeared for the first time in 1952 thanks to the development of rapid response gas analyzers, such as the mass spectrometer. On a practical level, the MBW consists in breathing an inert tracer gas at tidal volume through a closed circuit. Tracer gases could be exogenous like sulfur hexafluoride and helium for which a pre-phase of wash in is required and endogenous or resident as nitrogen. 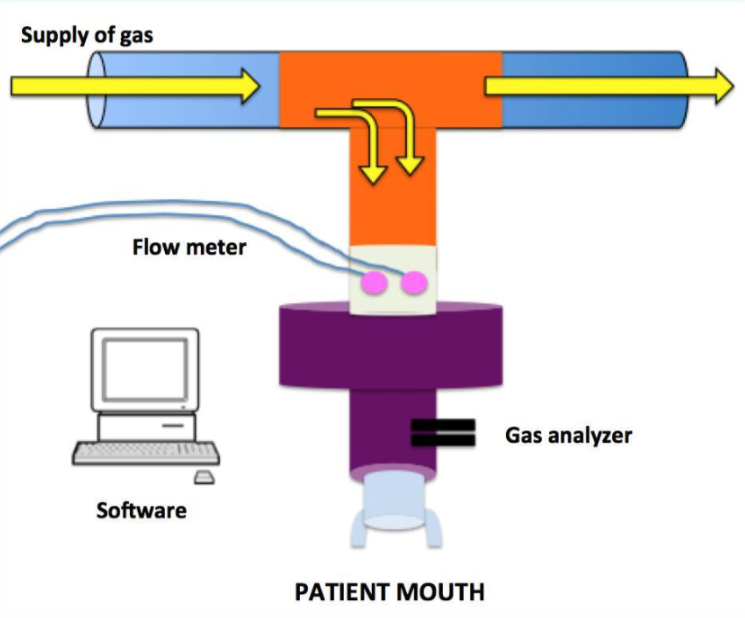 Through the analyses of end-tidal concentration of oxygen and carbon dioxide, a software derives indirectly the downward progression of the exhaled tracer gas that has to reach 1/40th of its initial concentration to declare the test concluded. This specific concentration is an agreement based on gas analyzer accuracy. The analysis of the gas trend allows to calculate LCI defined as the number of Functional Residual Capacities (FRC) required to achieve 1/40th of tracer gas initial concentration. LCI has been set aside for a long time since 1952 and has been back in vogue from the early 80’s thanks to the Lung Model theories of Crawford, Paiva and Verbanck (references 2-9). What emerges from their work is that the damage caused by respiratory diseases is not uniform but it develops heterogeneously and earlier than expected from peripheral airways. The specific differences between pulmonary regions, the different emptying and sequential filling of lung units, and the structural asymmetry present at acinar level are physiological phenomena that subsist also in healthy lungs but are accentuated by pathological processes such as inflammation of the airways, mucus plugging, the presence of atelectasis and bronchiectasis. MBW and specifically LCI offer important advantages and cues to understand pathophysiology and progression of respiratory diseases such as Asthma, COPD and Cystic Fibrosis,. Despite an higher feasibility especially among children, it is a time consuming test that require a operator specific training and a formal post-test quality assessment. 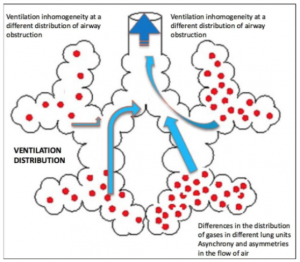 It is still of current importance to deepen the knowledge of the physiological and patho-physiological mechanisms of ventilation and MBW could lead to potential insights in the screening and management of respiratory diseases. 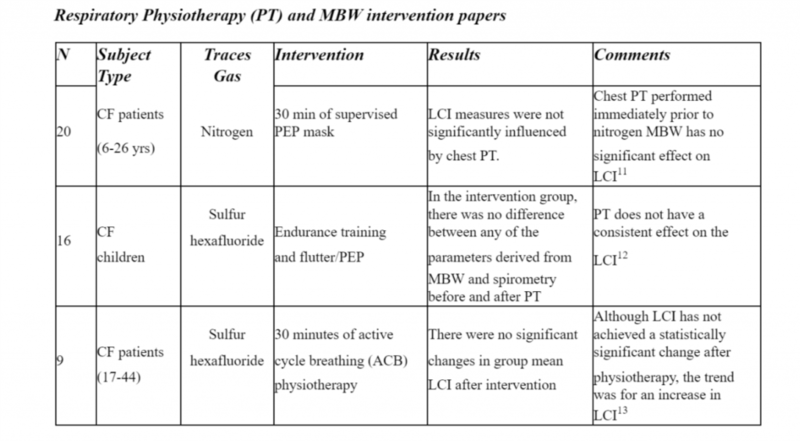 Despite LCI has not been able to detect changes in short-term physiotherapy interventions, further studies with higher sample size and methodological quality are required along with an more robust assessment of clinimetric properties of MBW apparatus and indices. Becklake, Margaret R. “A new index of the intrapulmonary mixture of inspired air.” Thorax 7.1 (1952): 111. Paiva, Manuel, and L. A. Engel. “The anatomical basis for the sloping N2 plateau.” Respiration physiology 44.3 (1981): 325-337. Paiva, Manuel, et al. “Inspired volume dependence of the slope of the alveolar plateau.” Respiration physiology 56.3 (1984): 309-325. Paiva, Manuel, and L. A. Engel. “Model analysis of gas distribution within human lung acinus.” Journal of Applied Physiology 56.2 (1984): 418-425. Crawford, A. B., et al. “Convection-and diffusion-dependent ventilation maldistribution in normal subjects.” Journal of Applied Physiology 59.3 (1985): 838-846. Paiva, Manuel, Sylvia Verbanck, and Alain van Muylem. “Diffusion-dependent contribution to the slope of the alveolar plateau.” Respiration physiology 72.3 (1988): 257-270. Crawford, A. B., et al. “Effect of lung volume on ventilation distribution.” Journal of Applied Physiology 66.6 (1989): 2502-2510. VERBANCK, SYLVIA; PAIVA, MANUEL. Model simulations of gas mixing and ventilation distribution in the human lung. Journal of Applied Physiology, 1990, 69.6: 2269-2279. Kent, Lisa, et al. “Lung clearance index: evidence for use in clinical trials in cystic fibrosis.”Journal of Cystic Fibrosis 13.2 (2014): 123-138. Kouroukli, E., et al. “P121 Short-term effect of physiotherapy on Lung Clearance Index among patients with cystic fibrosis.” Journal of Cystic Fibrosis 17 (2018): S93. Fuchs, Susanne I., et al. “Short–term effect of physiotherapy on variability of the lung clearance index in children with cystic fibrosis.” Pediatric pulmonology 45.3 (2010): 301-306. Horsley, Alex. “Non-invasive assessment of ventilation maldistribution in lung disease using multiple breath inert gas washouts.” (2009).